Yiannis Toumazis’s installation consists of two twin showcases set side by side in the entrance hall of the Maison de la Culture. 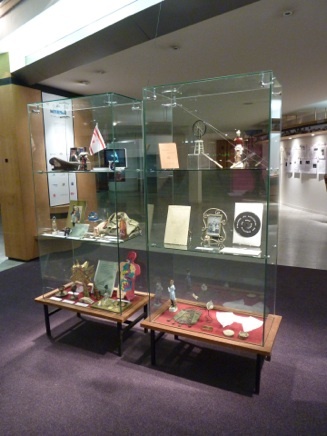 Each showcase has three levels on which objects are placed. The style of these showcases evokes the furniture of historical museums and libraries of the 1950s: tired red velvet covers the two wooden shelves on which the sheets of glass are placed. Because the showcases have no back, the whole of their content is visible from every quarter. Beside the two showcases, a pile of postcards and another pile of printed sheets of paper are available for visitors. The showcases display eclectic objects, identified by labels framed with a double black and blue edging: each object is given a number, a title, a medium, a place, and a date. 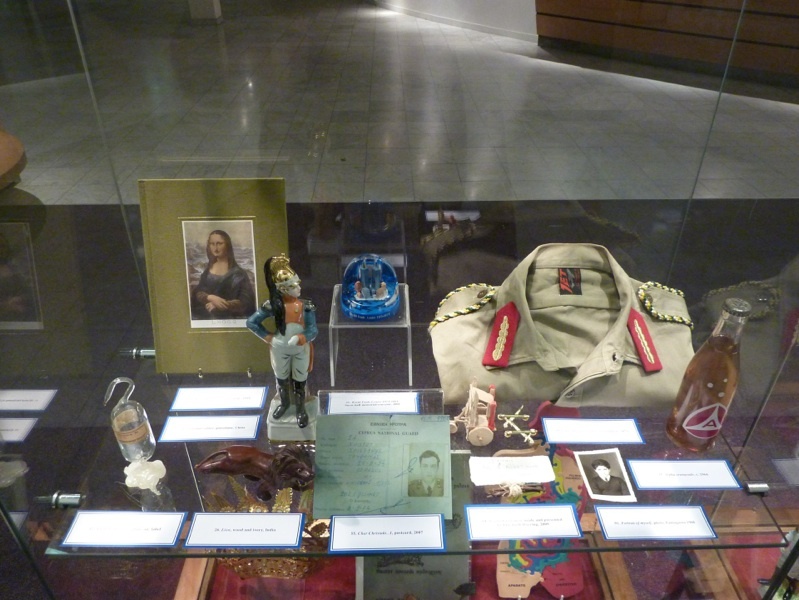 Personal photos, a military uniform of the Greek Cypriot army, a bulb filled with Famagusta air, a Turkish Cypriot flag, insignia and decorations, along with (☺) smile buttons, two bronze incense burners from the 19th and 20th centuries, oriental and orthodox, a lace collar, bits of pottery, plastic arum lily flowers, a miniature bicycle wheel, a reproduction of Marcel Duchamp’s L.H.O.O.Q. and Rotorelief, earth from the village of Akhna in the north part of Cyprus, where the artist’s grandparents are buried… the list is a long one and the inventory endless (because the content of the showcase can be changed every day)… Only one thing is not interchangeable: the identity card of a Greek Cypriot soldier, Christakis Christou of Tryfonas. “The work is a sequel to Cher Christaki… I, 2007, which consisted in a postcard and the facsimile of my open letter published in the Cypriot daily newspaper Phileleftheros. During a visit to the Army Museum in Istanbul, in the department devoted to Cyprus, I saw the national identity card of a Greek Cypriot officer, on view in a display case. Without knowing whether the officer was dead or alive, I wrote him an open letter published in a Cypriot daily newspaper published on 9 December 2007. It then emerged that the letter’s addressee was alive. He was captured by the Turkish army during the Turkish invasion in 1974, and had been subsequently released. He has been living and working in France for many years. In Cher Christaki…II, Vitrine en valise, I carry on my research into time and space, life and death. Having submitted my doctoral thesis at the Jules Verne Université de Picardie, on the subject “Marcel Duchamp, Artiste Androgyne”, I use the museum display, where the central object on view is Christaki’s identity card, I question the Duchampian notion of the inframince, that infinitely thin space, a point of intersection between dimensions. The objects exhibited in the display case, which change every day, for five consecutive days, come from a suitcase which I carefully packed in Cyprus. This suitcase contains a large number of personal items and objects. The display case itself forms a suspended space, a space of transition, which is possibly the projection of another dimension; a suspended space of art, ethnography, geography, and history, individual and collective alike. The impossibility for the spectator to understand the reasons for the interweaving of meanings, which explain the choice and organization of these objects, refers to the impossibility of extricating any clear and objective reading of the Cypriot situation.